We ask a number of questions at the end of the standard Employee Engagement & Satisfaction Survey to identify each respondent’s unique demographics. Reviewing your employees’ feedback by demographic areas is key to identifying areas of strength and developing action plans for improvement in the workplace. 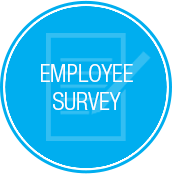 Organisations customise to obtain more value from their employee survey feedback. If the generic Job Role and Department selections on the standard employee survey don't align with your unique organisational structure, presenting custom response options will ensure that your feedback report segregates the survey response data into meaningful and actionable demographic breakouts. Employees will be more likely to select an accurate response. Presenting Job Role and Department response options that are familiar to your employees will help them to choose the correct response. They’ll also be less likely to default to the miscellaneous category of “Other” because they’re unable to recognise their specific category. As a result, the response data reported in the Job Role and Department demographic categories will be more credible. Maximise the quality and quantity of response data you receive. To maintain respondent confidentiality, we do not report any response data for fewer than five individuals in a demographic category. Grouping smaller demographics together increases the probability of having enough respondents in each category to be able to review their feedback. Capture the specific employee demographics that you want to measure. For example, smaller organisations often customise their survey to eliminate the Job Role and Department questions altogether and instead offer a single question to break out the data into “Manager” and “General Employee” categories. What is the highest level of education you have completed?" Employers using the online survey format may remove the Job Role and Department questions from view on the survey and instead pre-assign the appropriate response options to each employee’s email address. This custom service eliminates the opportunity for employees to inadvertently or intentionally select an inaccurate response. Is there any other feedback you’d like to gather while you have your employees’ attention? You may add up to five custom survey questions of your choice. The questions can employ variable response option formats such as yes/no, open-ended, or our “strongly agree” to “strongly disagree” response scale. The responses to these questions are not used toward consideration for the award. The 40% minimum survey response rate required to remain in consideration for the award is calculated using the random sample size, and not the total population surveyed, which increases the likelihood of achieving the minimum survey submission rate. Employers can gather feedback from staff working in offices outside of the programme area, or other associates (such as interns, consultants, seasonal staff, per diem employees, etc.) whose feedback is ineligible to be included in the ranking analysis to determine the award winners. Copyright © 2019 Best UK Dealerships to Work For. All Rights Reserved.